As Halloween is almost here, I'm ready to check out some Halloween statistics. You can have a lot of fun with Minitab on Halloween. Because we have Minitab, we can dig a little deeper into the data. The NRF gives some information about the proportion of respondents who participate and the proportion of participators who will celebrate with different activities. The proportions for participators are broken down by different age groups. There’s some rounding error, but I used the proportions in the data to estimate the number of celebrators in each age group, the number of celebrants planning to buy candy, and the number of celebrants who plan to hand out candy. I’m going to use binary logistic regression in Minitab to compare the age groups to each other. Are all age groups equally likely to buy candy? First, notice that the 45-54 age group is not printed in the table. This group had the highest proportion of celebrants who said they would buy candy, so I made them the reference level that Minitab compares the other groups to. The p-values show strong evidence that adults younger than 35 are less likely to buy candy than the 45-54 year olds. The statistical evidence is a bit weaker that people over 65 are less likely to buy candy than 45-54 year olds. The odds ratios are a convenient way to quantify how much less likely an age group is to buy candy than the 45-54 year olds. The smallest odds ratio belongs to the 18-24 year old group, who are only 0.28 times as likely to buy candy as the 45-54 year olds. Are all age groups equally likely to hand out candy? For celebrants planning to hand out candy, I kept the same reference level, 45-54 year olds. This time, the p-values show that the group of younger people who are statistically different from the 45-54 year olds extends all the way to 44. The older groups are statistically similar to the 45-54 year old group. The biggest difference in the odds ratios is still the 18-24 year old group, who are only 0.33 times as likely to pass out candy as the 45-54 year olds. It’s fairly clear that there are statistical differences between the different age groups. In general, being older makes you more likely to buy candy and more likely to pass out candy. But the biggest mystery Halloween mystery of all becomes apparent when you look across categories of activities. 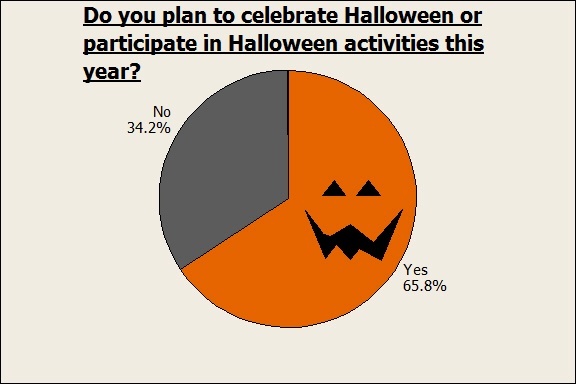 If 97.4% of 45-54 year olds are going to buy candy, and only 78.9% are going to hand that candy out, what are the other 18.5% planning to do with it? These data won’t answer that question for us.